The revelation of the gospel of grace has flooded the hearts and minds of many in the Body of Christ. When any truth comes forth, questions may arise. One question critics bring up is what about sin? How do you "hyper-grace" preachers deal with the subject of sin? The short answer, (not being smart) is we don't deal with sin. Jesus already dealt with it at the cross over 2,000 years ago! He paid the full price and sat down, signifying the work was complete, finished, done! We rejoice in His work not in our performance! The longer more specific response? It is simple, really. It's running to God whenever we miss it not running from God. Let's coin a modern phrase for this. Hot pursuit! It means laying aside all other interferences, distractions, obstacles, anything vying for your attention. When a Law enforcement official is in hot pursuit, they're not halting movement to view the pretty sunset. They're going forward until they apprehend their target. The application of this illustration is only in the sense of complete and total focus on the prize. You see we've already been apprehended by our Father's love! When we miss it He doesn't leave us. He hasn't broken fellowship. He said He would never leave us or forsake us. He didn't add a clause to that promise saying I will never leave you unless of course you break fellowship by sinning or doing your own thing. This doesn't infer that we live a lifestyle of carnality and fleshly pursuit either. Now what do we mean by running back to God when we sin? It means we don't shrink back from God. It means we should run to Him and remain in His presence regardless of our emotions of guilt and grief. When we shrink back we impede maturing in Him. You see we are already accepted in Him. We want to grow in the grace of God. It's realizing this is a relationship with God as our Father. It is not an employee and employer contractual agreement business partnership. Let's see how Jesus dealt with the sin of one of His own. Did Jesus kick Peter to the curb when He blew it? At that moment the Lord turned and looked at Peter. Suddenly, the Lord’s words flashed through Peter’s mind:“Before the rooster crows tomorrow morning, you will deny three times that you even know me.” And Peter left the courtyard, weeping bitterly. Peter sinned by actually denying Jesus Christ! One translation even states he cursed and swore that he never knew Christ. Denying the Lord is pretty serious. So what did Jesus do about it? Note that Jesus didn't charge the sin to Peter's account. He had paid for the sin debt and dealt with it. He considered Peter a disciple not a fallen sinner. By calling Peter a disciple Jesus effectively removed the shame attributed to Peter's failure. (Now I'm not implying a type of universalist view of salvation. Peter accepted this forgiveness). Peter received the Lord and His salvation. This is the point in time where the disciples became born again Children of God. They believed on the Lord and received His gift of righteousness. After Peter was born again he received the forgiveness of his sin. Take note that Jesus never threw Peter's sin in his face. Also note that while Peter had been completely forgiven, he still was not serving in ministry at this time. He had gone back to fishing. He needed ministerial restoration. Did Jesus withhold restoration? 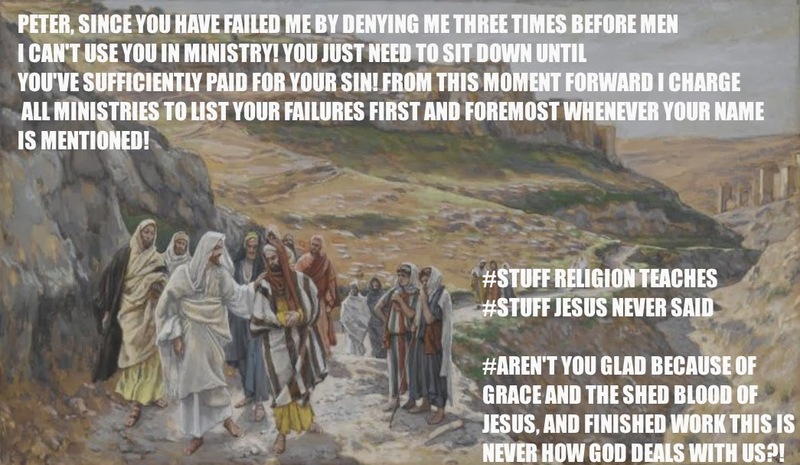 Did Jesus simply forgive Peter but "sit him down" until he repaid the sin debt of denying Jesus? No! Jesus forgave Peter, and restored him into a more fruitful ministry. Jesus appeared on the beach where Peter was fishing. When Peter heard that it was Jesus what was his response? He ran toward Jesus! He didn't shrink back and hide. Five or so verses later in this same chapter we see Jesus actually restore Peter to the place of ministry the Lord had called him to. So what is the "hyper grace" response to sin? It begins with the understanding that because of the finished work He isn't imputing our sins to our account. We have no ability to "pay" for our sins anyhow. Even if you sat down from ministry for a hundred years. You could never repay your sin debt. The next thing is repentance or changing our minds (our thinking) about any behavior contrary to Him or the Word. It's choosing right believing over wrong believing. It's confessing our right standing even in the midst of our worst behavior pattern. This is what produces real heart change not behavior modification. It's maturing into what we've been made on the inside already. Finally it is running to God. It is never running from Him or shrinking back. It is running to Him knowing He always has better for us, more than anything this World can offer. Grace is the true answer for sin in this age. Not moral codes or lists of rules. Law demands but grace supplies! Praise the Lord! Thanks for reading. I appreciate your feedback. If this has blessed you feel free to share with your friends and loved ones.